Recently I read a chapter on drag systems from the 2007 book “Fishing Techniques” by Steve Cooper (ISBN 1865131067, 9781865131061). It really got me thinking as it raised some excellent points. Cooper stated that “drags should be set at 25% of the lines breaking strain with a full spool of line. To make sure that the setting is correct use an accurate spring scale, with the rod pointing along the line to the scale. Do this no less than 10 times to ensure that the friction surfaces of the drag components are bedded together and heated up the way they would be when playing a fish. As the angler it is up to you to ensure your drag is smooth and correctly tensioned. It is also important to monitor the performance of your drag during a fight. During a fight with a fast, powerful fish, be prepared to adjust the drag, particularly as your spool diameter decreases. A series of tests by Aftco demonstrated the importance of reel dynamics. The tests found that as the diameter of the line on the spool decreased more force was needed to pull line off the reel. When the diameter of the spool is halved, the true drag setting on the reel will have doubled. To put it another way, when the line diameter on the spool is down to one quarter its original size the amount of drag will have increased four fold. Therefore, if you set your strike drag at 25% of the breaking strain of the line, your line will now be at breaking point“. However, Cooper is absolutely correct regarding the increase in drag setting as the line diameter on the spool decreases and this is something that most anglers are unaware of. It is a well established engineering principle derived from the mechanics of lifting pulleys. As you can imagine ignoring the increase in drag as the diameter of the line on the spool decreases could have dire consequences if you are hooked up to a trophy fish that is pulling line of the spool at an alarming rate. It does not matter what type of reel it is (fly, spinning or overhead) the principle that drag increases as line diameter on the spool decreases holds true. My preference is to dropping the rod tip initially and only adjust the drag as a last resort if there is time and the conditions warrant. I have calculated, using a spring balance, the drag reduction possible per complete turn of the drag knob on my spinning reels and this allows me to back off the drag with a little more certainty. It is worth doing this even though you may rarely have to use the information. Cooper also goes on to discuss other tests completed by Aftco on the stress water friction can add to fishing line. “A boat simulating a fish took about 220 metres of 24 kilogram monofilament and made a 135 degree turn at 9 knots. Less than 2 kilograms of pull was felt at the reel but at the ‘fish’ the pull registered 10 kilograms, four and a half times the strain at the reel. Intelligent adjustment of the drag setting to counter these effects comes with experience. Keep it in mind for the day the XXOS game fish comes along”. 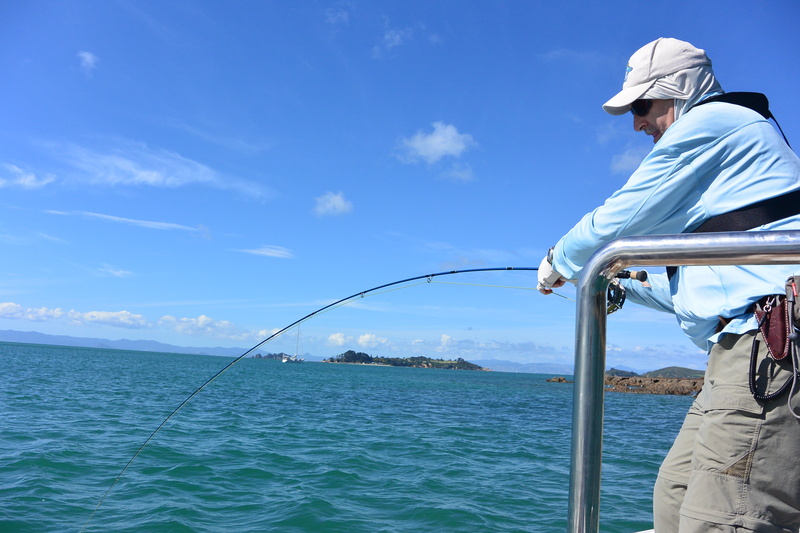 Charter boat skippers get around this issue by aggressively manoeuvring the boat to allow the angler to keep in direct contact with the fish and minimise the amount of line that is in the water. In conclusion, it is very important to understand how drag pressure varies with line level on the spool and the effect of water friction can have when there is a lot of line out dragging through the water. Understanding this will allow you to adjust drag settings to increase the chances of landing larger fish more often. I have enjoyed stumbling on your web page and the articles in you all produce. I was hoping to use this one for our club newsletter after receiving a few questions from new members around drag settings on reels. Would this be ok? Please Private message on the email address if you would like to discuss further.